How To Run Multiple Dropbox Accounts in Windows 10? This tutorial covers how to run multiple Dropbox accounts in Windows 10. Dropbox already comes with its own desktop client which is pretty good. But, the thing is it doesn’t help you connect multiple Dropbox accounts. Therefore, if you are one of those users looking for some simple option to run multiple Dropbox accounts in Windows 10 PC/Laptop, then this article is definitely gonna help you. To connect and use multiple Dropbox accounts in Windows 10, I have covered some good and free software. All these software serve the purpose very well. 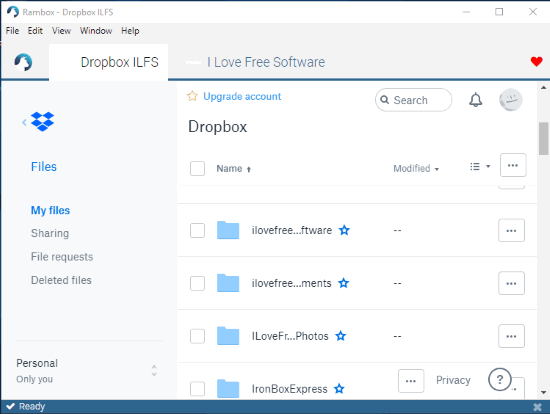 These software bring web interface of Dropbox to their interface which further helps to use Dropbox from the desktop without any browser. Once one Dropbox account is added, you can add another Desktop account. As a result, you can add and use multiple Dropbox accounts from one platform in Windows 10. Whether you want to access files, upload files and folders, download some file, or do other things, you can do that very easily. Let’s check these free software one by one. 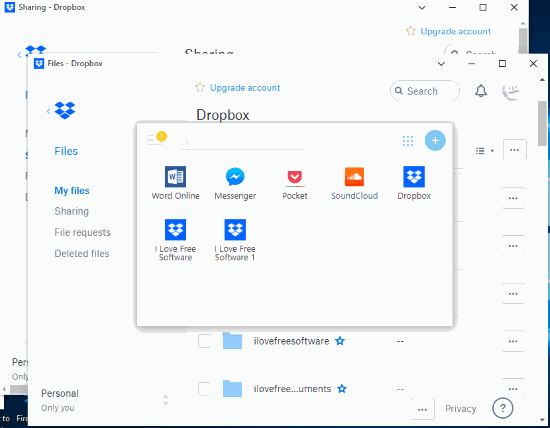 Wavebox software is one of the best options to connect and use multiple Dropbox accounts in Windows 10. The software lets you pick a different color for each Dropbox account (while adding them) so that you can recognize an account easily. Also, while adding a Dropbox account, you can set options like show/hide unread count in sidebar, notifications, sleep tab after the set number of minutes of inactivity, etc. Adding your Dropbox accounts is also pretty simple. Install the software and launch it. Then, use “+” account visible on the bottom left side of its interface. A pop-up will open using which you can search for Dropbox. Select Dropbox, pick a color, set other options, and then it will open a tab showing the Dropbox homepage. Now you can log in with your Dropbox account. You can see Dropbox icon on the left side for that account. In this way, you can add other Dropbox accounts. It also supports Dropbox Paper and many other services. For example, you can connect LastPass, Basecamp, Trello, Gmail, GitHub, WhatsApp, TweetDeck, etc. Firework software helps to connect and use different services such as Google Keep, Word Online, Messenger, SoundCloud, Microsoft To-Do, Gmail, and more. The good thing is you can add multiple Dropbox accounts too. 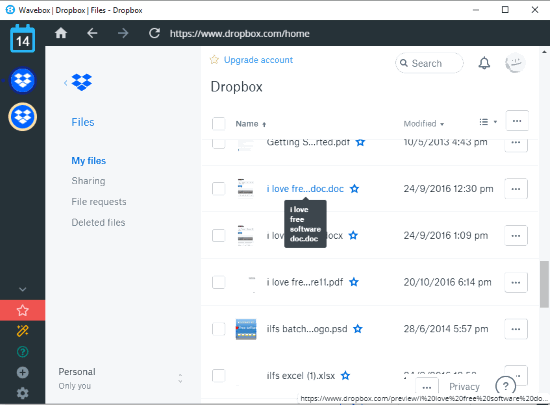 For each Dropbox account, it provides a separate window and you can also adjust the size of each window as per your needs. Download and install Firework software. Open its interface and there you will see Word Online, SoundCloud, and some other services. You need to click on + button available in a circle on the top right corner. Enter Dropbox URL in the given box and give a name to it. This will help you recognize the service on software interface easily. After that, click on Add button. Now again, follow the above steps, and before clicking on Add button, select “to separated profile” icon available on the bottom part. Then only you have to use Add button. You have successfully added Dropbox URLs with separate profiles. That means you can add two different Dropbox accounts. You can add more accounts also. Now, click on a Dropbox icon visible on its interface and log in with your Dropbox account. The software interface will show web version of Dropbox account. In a similar way, you need to log in to another Dropbox account. Rambox software is similar to Firework software. It also lets you connect multiple services (Evernote, Google Keep, OneNote, Gmail, etc. ), 99+ services in the free version, to use them from a single platform. Dropbox can also be added and used with multiple accounts on its interface. Download the software and run its application file. On its interface, you will see multiple services but Dropbox won’t be there. So, use Search box, type Dropbox and then it will show “Custom Service” option. Select that option. Now you need to give a custom name to the service you’re going to add. Along with that, you need to add service URL (which would be Dropbox homepage URL), and then click on Add_Custom Service button. A new tab for that service will be opened on the interface of the software. There you will see Dropbox homepage. That’s it! You can sign in to your Dropbox account. In this way, you can add more Dropbox accounts. These are some simple and effective options to run multiple Dropbox accounts in Windows 10. The first one is simpler than other options. Still, I must say, all these options serve the purpose of connecting multiple Dropbox accounts and using them from one platform very well. Therefore, all are equally useful.